Tokyo College of Music celebrated the 100th anniversary of its founding in 2007. The oldest private music institute in Japan, TCM has been contributing significantly to the development of Western classical music at home. It created the very first symphonic orchestra in Japan which performed on Pacific Ocean steamers from 1912 to 1929. Over the years, Tokyo College of Music has taken great strides in strengthening its faculty and staff as well as expanding the facilities of the school. Now the college boasts a highly qualified and distinguished faculty of more than 440 with the entire student body, under the umbrella of Tokyo College of Music, of over 2000 students. This includes some 1,500 undergraduates, 130 postgraduates, 220 high school students, 80 kindergarteners, and 100 Music Preparatory School students. The College’s facilities include an 806-seat 100th anniversary Hall, B-studio with a baroque style pipe organ, J-studio, Synthesizer Lab, recording studio, Traditional Japanese Music House, Gamelan Performance Studio,labrary and practice rooms. 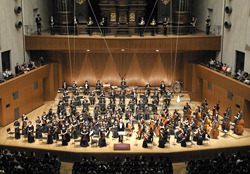 The Tokyo College of Music Symphony Orchestra has a long tradition and excellent reputation both nationally and internationally. Each year it holds concerts at the Tokyo Metropolitan Art Space and benefit concerts for UNICEF. Internationally it has performed in over 30 cities in Europe, the U.S.A. and China. In 1993, the orchestra went on tour to Chicago, New York and Washington, D.C. The Washington Post and many other local newspapers praised their performances of Dvorak’s Cello Concerto in B Minor with the master cellist Janos Starker and under the baton of maestro Junichi Hirokami, a college alumnus. The Washington Post described maestro Hirokami as a young conductor “who finished the evening with a lucid, animated and deeply interpreted reading.” The orchestra had previously received a letter of encouragement from the Minister of Foreign Affairs of Japan before their departure. The college donated half of the total amount of ticket sales to UNICEF and the other half back to each performance venue. The orchestra has also appeared at the Music Festival Argerich’s Meeting Point 2006 in Japan, performing Beethoven’s Piano Concerto No. 1 and No. 2, as well as Shostakovich’s Cello Concerto No. 1. They received great praise from the festival’s director Martha Argerich, the cellist Mischa Maisky, the pianist Stephen Kovacevich, and the conductor Tatsuya Shimono. with the orchestra having received standing ovations from the Viennese audience at the Musikverein Zaal. Proceeds from each concert were donated to the SOS Children’s Villages (SOS-Kinderdore.V.) in Munich and Bamberg, the Stiftung der Eheleute Livia und Vaclav Klaus in Prague, and St. Anna Kinderkrebsforschung in Vienna. In the following year, with maestro Myung-Whun Chung at the baton, the Tokyo College of Music Symphony Orchestra performed Rigoletto receiving high praise from the maestro and leading music magazines in Japan. From March 22, 2012, the orchestra made a benefit concert tour to the Czech Republic, Hungary, and Austria. Sacramento/ California, Temple/ Arizona, and Coverllis/ Oregon. 1979, Goodwill Concert Tour to China-Beijing, Hangzhou, and Shanghai. West Berlin, Leipzig, Dresden, Jena, Weimar, and Hoyerswerda. 1993, Concert Tour to U.S.A.-Chicago, New York, and Washington D.C.
in Hungary, and Graz in Austria. The John F. Kennedy Center for the Performing Arts, Washington D.C. 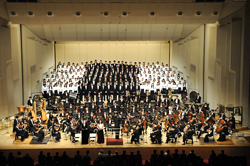 The Tokyo College of Music Chorus has been actively performing with professional orchestras both nationally and internationally. With the Japan Philharmonic Orchestra, TCM Chorus has performed Beethoven’s Symphony No. 9 in d-minor, “Choral” every year since 1979. Other pieces performed under this collaboration include Stravinsky’s Symphony of Psalms (Symphonie de psaumes)(conductor: Junichi Hirokami), Mozart’s The Great Mass in c-minor (Große Messe in c-Moll) (conductor: Alexander Lazarev), and Verdi’s Messa da Requiem (conductor: Kenichiro Kobayashi). With the NHK Symphony Orchestra, they have performed Mendelssohn’s, A Midsummer Night's Dream (Ein Sommernachtstraum), (conductor: Jun Märkl) and Mahler’s Symphony No. 2 c-minor. “Resurrection” (Auferstehung）(conductor: Markus Stenz). Its performance of Haydn’s Die Schöpfung under the baton of Junichi Hirokami had an honor to be chosen to be the second most memorable performance of all NHK Symphony Orchestra’s concerts during the year, 2005. In 1988 the TCM Chorus made its European debut at the Franz Liszt Academy of Music (Zeneakademia) in Budapest, performing G. Verdi’s Requiem. The chorus also performed G. Faure’s Requiem at Concertgebouw in Amsterdam on the same tour. In 1998 the chorus collaborated with the Netherlands Philharmonic, performing Carl Orff’s Carmina Burana at Concertgebouw and at Muziekcentrum Vredenburg in Utrecht. Established in 1970, the Tokyo College of Music Wind Ensemble has been performing for mare than 40 years, both inside Japan and abroad. It holds concerts annually at many main halls in Tokyo including Tokyo Metropolitan Art Space, Tokyo Bunka Kaikan (Tokyo Cultural Center)and Orchard Hall, to name a few. It attracts audiences with its vibrant and dynamic performances of symphonic wind literature. earning much respect among music schools and musicians in the country. The TCM Symphonic Wind Ensemble has a long recording history and is included on the historical compilation recording, “A 150 Year History of Japan Since the Black Ships Band”, which may be found on King Record srecords. TCM Professor Emeritus and violist Toshiyuki Uzuka launched String Ensemble Endless in 1990, offering a great opportunity to perform in a string ensemble outside of school. Since then, Endless performs annually at various music venues in Tokyo such as Tsuda Hall, Suntory Hall (Blue Rose), Casals Hall, and Toppan Hall, garnering critical acclaim in each performance. Its repertoire spans from classical to contemporary with music by Mozart, Schubert, Mendelssohn, Tchaikovsky, Respighi, Bloch, Yasushi Akutagawa, and Toru Takemitsu. The ensemble has recorded with Somei Sato on the CD Toward the Night, hitting the music charts in London. Tokyo College of Music encourages students to enter competitions. Our entire family wins more than 100 prizes at home and abroad every year. The college holds its own competition and prize, Tokyo College or Music Competition (2011 for Strings/Wind and Percussion majors and 2012 for Piano/Vocal) and The Tokyo College of Music President prize for students majoring in Composition(Fine Art). Tokyo College of Music is in the heart of Tokyo with easy access to main Concert Halls, which promises your life very music friendly one. ©Tokyo College of Music. All Rights Reserved.